After our long journey up the very busy M6 we finally arrived at the Marton Arms for a well needed pint, we met up with our leaders Mark and Jess and a few other cavers, Mark had already sank a few so we had some catching up to do! After a chin wag and sinking a few drinks ourselves we decided to head to the YSS where we would be stopping. We carefully crept in trying not to wake anyone, which didn’t last long after crawling into our bunks Tony decided to make as much noise as possible by dropping his phone after the first, second and third trip to the bathroom. With our alarms waking us in the morning, we met the women who we were sharing a room with, which we apologised profusely for our drunken bumps in the early hours of the night before. Saturday Myself, Mark, Jess and Tony started our day with a full English at Inglesports, which seems to be the traditional way to start a caving trip. 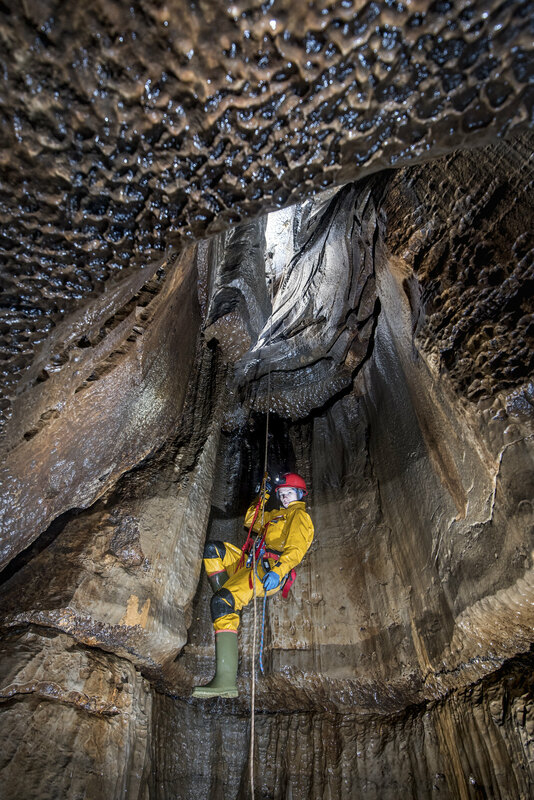 After a satisfactory filling we headed towards Bullpot farm, Red Rose caving and potholing club and had a steady walk over the moor to county pot entrance, we got our srt kits on and climbed down the entrance shaft of the cave. We walked through a very narrow winding passage, me being super careful because it was a brand new srt kit and I didn’t want to scratch it – which didn’t last long clanging it through the tight canyon. We then came to the first pitch, with Mark in front he started rigging and made the decent look effortless, I was to follow. Despite the large breakfast I had earlier shovelled into my mouth, turns out the descent wouldn’t be so easy for me. With a mixture of an old, thick rope and a new descender, Jess watched as I did my checks, I dangled over the first pitch, yet I still failed to move. They all thought it quite comical, a feather could of gotten to the bottom quicker, all 7 and a half stone of me was going nowhere fast! After a few meters Mark was able to grab my feet to pull me down, which still wasn’t an easy descent.. I got to the bottom eventually, just not as graceful as I thought! With one more pitch to do, we carried on through the cave. Mark climbed up Poetic Justice seemingly effortlessly, I gave it a shot but failed, then Tony went for it. I could just see his wellies disappear up the chimney, with a few grunts that followed he made it to the top too. Mark rigged a line and me and Jess climbed up to join them and then we did the crawl to the final pitch, which proved just as difficult for me as the first! We got as far as Eureka Junction in the main drain, past the Wretched Rabbit passage and then headed back. Thankfully, me being the weight I am – going back up the rope was far more pleasant! All in good time, Mark took some photographs and then we headed for the surface. The day ended the same as it had began, stuffing our faces only this time with a curry, Chloe and her partner Mark had joined us for the feast, ready for tomorrows adventure. Sunday we awoke to a bit of drama, Chloe and Mark were already outside and told us a vehicle had got stuck on the far car park. I was expecting a car in a pot hole, what I wasn't expecting is a Mitsubishi 4x4 camper van to have completely nose dived into ditch with just the back wheels and boot popping out! Unsure how the owners did manage to get out in the end, seeing the pictures on Chloe's phone, getting the vehicle in must have been an special achievement in itself! After having a giggle at someone else's misfortune, myself and the group headed to Inglesports, you guessed it – for breakfast! The group gained another 2 cavers, Keith and Kay who were already there tucking in! We ordered, ate and pondered around Inglesport. Me and Tony treated ourselves to new under suits, which we tested out later that day. We all collected outside, and headed for our cars to make the trip to Alum Pot. Mark and Jess went ahead to get permission from the farm nearby so we could park on their land. Once we all parked up, we started to get ready and put our kit on, me being the first to be dressed, I was so eager to do this trip! There was a lot of equipment to carry between us, so we all got together and took a bag each. They weren't light! I must have looked like a little donkey, with an srt bag on my back and a rope bag on my front to balance myself out, we made the 15 minute walk to the cave. When we got there we split into 2 groups. Our leader Mark, Keith and Tony stayed at the head of Alum Pot, Keith wanted to get some video footage of Mark doing the 80m pitch – the brave man! Tony stayed behind with them to help. That left our other leader Jess, myself, Kay, Chloe and Mark to head towards the entrance up the hill via Dolly Tubs. We got into the cave, paddling through the passages and dunking into pools of water before reaching the Cheese Press in Long Churn, where Jess and Kay both insisted I give it a go as it was my first visit. So, I awkwardly lifted myself into the tight squeeze, only to find out it wasn't as tight as I had imagined, I slid through it like a knife through butter – this is where my slight, petite build did me justice, making up for my poor descent efforts the previous day on the rope! I joined the others round the corner as they bypassed this route, we then put our srt kits on ready for the first pitch. Kay headed off first followed by Jess to do the rigging, whilst myself, Chloe and Mark waited patiently. I was very nervous about this pitch, I knew it was the highest one Id done so far being 15m in length. By then Mark, Keith and Tony had caught us up, I felt better knowing Mark would be talking me through it as Jess was already at the bottom of the pitch. Both leaders have filled me with confidence on previous trips and I feel safer knowing I'm with them. There aren't many people who I can say that I trust my life in their hands, but Mark and Jess are 2 of them and I feel I'm progressing as a caver through their help and support. I got to the top of the pitch accompanied by Mark, I hooked in my cows tails and took the rope I’d be descending on. I threaded in my descender, tested it by leaning back and locked off. Mark was slapping my hands, telling me to take my hands off the rope and to trust the kit, which is easier said than done being a newbie and dangling over a drop. I did as he said and leaned back, he then instructed me to take the lock off and make sure its clear where I'm going, thankfully it was kinder rope than yesterday, I travelled down it far more easier. I got to the bottom of the pitch where Jess was waiting for me and took over. I hooked my cows tails in once again and did the final pitch with confidence, got my feet on solid ground and shouted the all clear “Rope free!” I turned around and I was not prepared for what was in front of me, I was stood on the balcony pitch looking down into Alum Pot. The pictures on Google do not do it justice, it was breath taking! I was stood in sheer amazement, In ore of the view. We descended once again, this time passing a re-belay where I got a little stuck because my foot loop was shorter than my cows tails. But Jess was to the rescue, she lent me her hand ascender and I was free to move further down the rope. I got as far as the bridge, Tony, Mark and Kay went on to the bottom of Alum Pot, the rest of us started to move back towards the balcony and they caught us back up again after their deeper exploration. 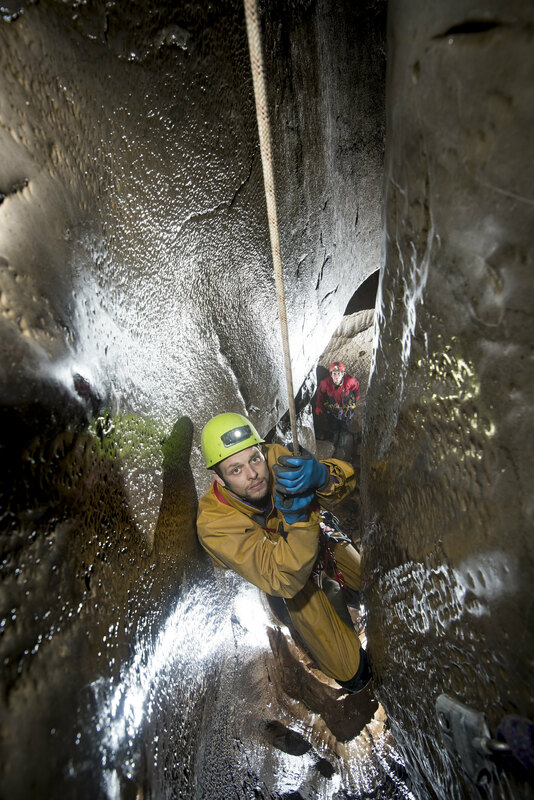 We travelled back through the cave, hauling the bags still, only this time they were full of water and wet rope. 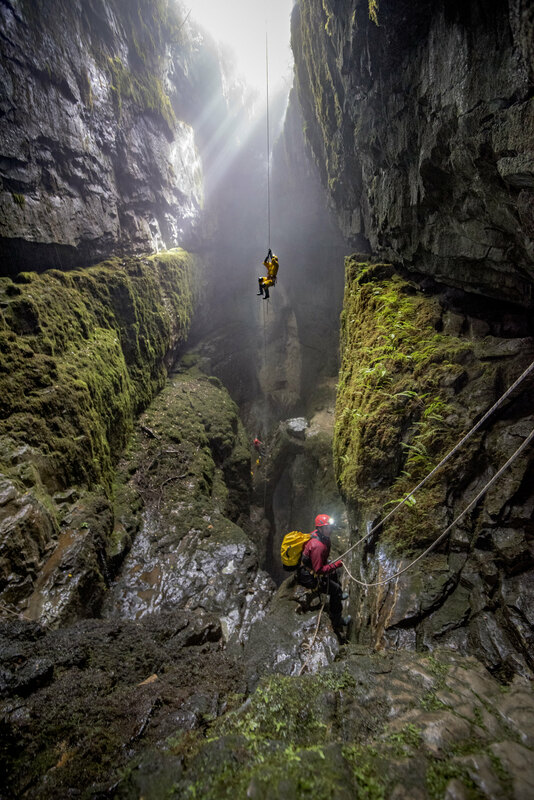 After climbing the 2 pitches, myself, Tony, Chloe and Mark were free and safe to carry on through the cave to reach the surface, I came out of the entrance with wellies full of water and huge grin on my face with what I had just seen. I already can't wait to go back and explore another entrance, I can’t put into words how I felt about this trip, but proud is perhaps the most fitting. To top the weekend off, we had the long drive down the M6 back towards Dudley HQ shortly after having a coffee with our club mates. With a Motown cd quietly playing in the back ground we headed through the winding Yorkshire roads towards a more populated civilisation – the dreaded M6. I don't think we had been on the M6 15 minutes, when flashing blues pulled us over onto the hard shoulder. The police officer approached the side of the car where I was passenger, I wound down the window. He had said the reason he had pulled us was because the vehicle was registered to a female owner and the concern was a male was driving. I pointed to the rear of the car and said “Officer, this is my car. We’ve had a weekend in Yorkshire caving and my legs have had it, so Tony has kindly offered to drive us home”. He looked at us and in the back of my car, I think he felt sorry for us, we did look a little worse for wear! – We possibly smelt a little too. He checked our details and said we were braver than him for caving, we could of chatted his ear off about our events that day, but we both kept quiet so he could continue his day. He waved us off and we continued our journey home. Fabulous photos from Mark as ever!